Native American art and Southwest paintings from a private collection from Columbus, Texas. This avid collector shared his time between Santa Fe and his hometown of Columbus, Texas. Over 40 years he collected works from known artists such as Joseph A Imhoff, Robert C Rishell, Ila McAfee, Clarence Ellsworh,and many others. He built, with the assistance of recognized experts, an amazing collection of Native American basketry, pottery, weaving and carving. 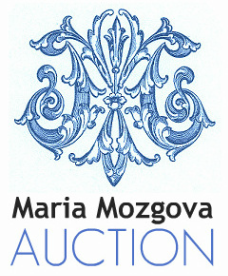 To see the online catalog, please click on the "Live Auctioneers" sign below. Navajo Yei Polychrome Wedding Basket, Hopi Large Domed Lidded Basket with Handle,Pima-Papago Polychrome lidded Basket, Iroquois Beaded Box, c. 1914 , Navajo Weaving, Zuni Sterling Turquoise & Coral Belt Buckle & Ring, Sioux Bag, Southern Plains Woman's Hide High-top Moccasins, Sioux Fully Beaded Moccasins, Patrick Cunningham (1925 - 1984), Clarence Arthur Ellsworth (1885 - 1961), Papago "Man in the Maze" basket, c. 1960, Southwest Coiled Basketry Tray, Apache, c. 1900, Ila McAfee (1897-1995), William Johnson (1925 - 2003), Pima Basketry, Southwest Coiled Basketry Olla, Apache, c.1900, Santa Clara Pueblo Oval Bowl by Pablita Chavarria, Early Chimayo Blanket, circa 1910, William E. Johnson (1925 - 2003), Joseph Roy Willis (1876-1960), Two Inuit Eskimo Carved Stone Bears, Eskimo Walrus Ivory Carving, Navajo Weaving / Rug Germantown, Silk Scarf, Hermes, "Pani La Shar Pawnee", Joseph Adam Imhoff (1871 - 1955), Robert Clifford Rishell (1917-1976), Oil on Canvas by Lee Heartwell, Walrus Tusk Scrimshaw, Two South Carolina Basketry Items, Ojibwa Small Sweetgrass Lidded Basket, Paiute Beaded Basket, Northwest Coast Carved Totem Pole 23", Three Kachina Dolls by D. Livingston, Two Mesquite Wood Jewelry Boxes w Turquoise Inlays, Santa Clara Pueblo Bowl, Pastel Portrait attributed to Roy Reynolds, Three Zuni Katchina Clowns, African Warrior Sculpture, Two Hopi Flat Baskets, Modoc Basket, Aleut Basket.